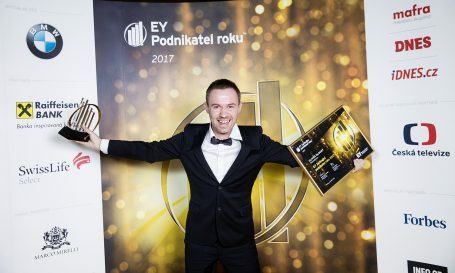 Oliver Dlouhý, founder and CEO of Kiwi.com, one of the world’s leading online travel agencies, has won the prestigious EY Emerging Entrepreneur of the Year 2017 Czech Republic. Moreover, Oliver Dlouhý was among the finalists for the main category of EY Entrepreneur of the Year 2017, coming in second, just a single point behind first place. Oliver was awarded the EY Emerging Entrepreneur of the Year 2017 Czech Republic due to Kiwi.com’s phenomenal growth that has turned it into one of the most successful Czech start-ups with customers all over the world. Its revenue has grown by almost 15,000% over the previous five years to reach CZK17.7 billion (around €700 million) in 2017. EY, a global leader in assurance, tax, transaction and advisory services, started the program to recognize the world’s most successful and innovative entrepreneurs. The EY Emerging Entrepreneur of the Year awards are bestowed on the most successful entrepreneurs aged below 30 years old. “I am thrilled to win the EY Emerging Entrepreneur of the Year. It is a huge acknowledgement of the all work that I and my team have put into Kiwi.com over the past five years. When I started, I never thought that from the small team we had then that we would grow into a business with 1,700 employees around the world. This award is for all of us at Kiwi.com, a reflection of the team effort where everyone has his or her own important role to play,” says Oliver Dlouhý, founder and CEO of Kiwi.com.